I had to take a break for a few weeks because I’m taking my chances at starting my life over in Colorado and for the first couple of weeks, I was couch surfing. Now I’m somewhat settled and I have the time to get back in touch with the stars. For those of you who kept checking in, I’m glad that you find my forecasts useful and I hope you enjoy this one. 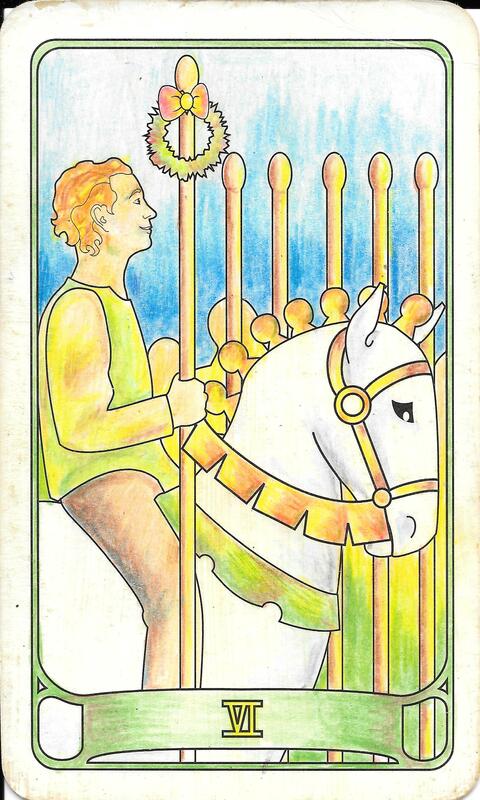 The overall energy for the week is the Fool, which is really interesting because the card for last week was The World. Last week was a very powerful ending to some very major things in our lives. If nothing completely fell apart last week, it made you aware aware of things rearranging themselves. Like The Fool, you need to jump right into whatever is starting in your life. The tricky thing is, that since Mercury is going into retrograde, it’s not a good time to start anything at all. Therefore, the new beginning brought by Mercury retrograde should be completely passive. Let these things be the ones that flow to you without being asked for. It’s the 20th week of the year so in numerology, this is a 2, calling for us to seek out balance. Ironically enough, the Sun enters Gemini on Thursday at 4:45 AM EST, the sign of the Twins. But the power of Gemini will be muted since Mercury is in retrograde. 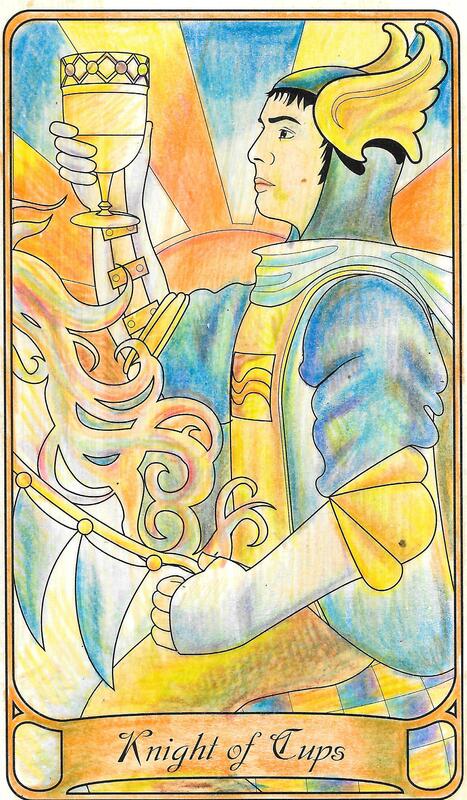 The Knight of Wands is our first card in the week of the Fool. The Knight rushes head first into everything with passion. The Fool and the Knight have a similar feeling in that aspect because the Fool, also a risk taker, sets off with a big leap off a cliff. The New Moon is on the horizon and Mercury is about to go into retrograde so it’s a terrible time to begin anything new. Instead, flip your view and get excited about cutting ties you don’t need, wrapping up projects and doing a little late spring cleaning. This energy echoes in the material world as you may have the impulse to buy things that you don’t need when the Moon squares Jupiter. The number of the day is 3, reminding us that no matter how waiting for something can feel like torture, everything happens in due time. Wow, there’s a lot going on today! 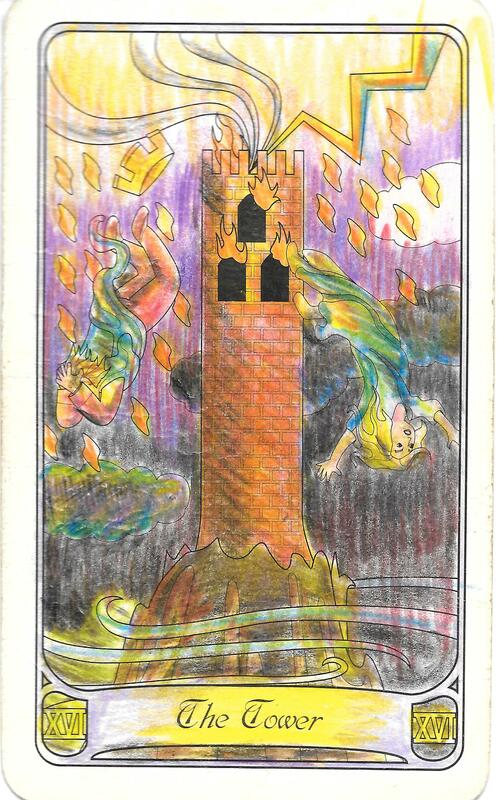 Right off the bat, everything says, “Just go with it.” The Tower card is a reminder that even though there are times in our lives when we face unavoidable destruction and misfortune, these things lead to new beginnings. The Moon enters Gemini at 5:27 AM bringing with it a tendency to be indecisive yet spontaneous. However, anything you’ve been putting of deciding could come back and slap you in the face today, with the appearance of the Tower card and Mercury going retrograde. Trying to talk yourself out of problems will only make them worse with the communication challenges that come with Mercury retrograde. The Moon makes an opposite with Saturn, bringing a heaviness bearing down on your conscious about what to do. However, the Moon is conjunct with Mars, giving you the courage to work through thigns. There may be a tendency to deceive yourself with the Moon making a square to Neptune, but the outside influences will bring you back to reality. In numerology, the number of the day is 4, reminding us that in order to achieve stability, the air has to be cleared. Mantra: Things come together and fall apart, then come together again. A note on Mercury Retrograde: Mercury will be in retrograde until 6/11. It’s not a good time to start any new projects because things often do not go according to plan. Instead, focus on wrapping up old projects and taking the cosmic trash to the curb. 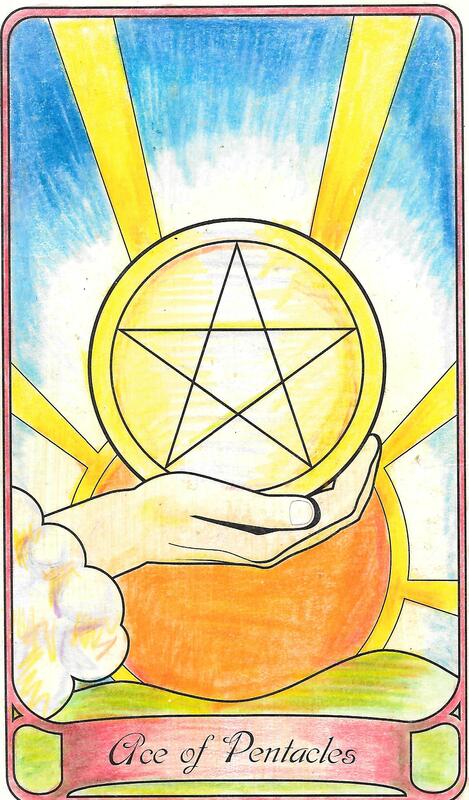 The Ace of Pentacles signals the beginning of financial abundance but due to the numerology of the day, 5, and the fact that Mercury is now in retrograde, I’m going to go ahead and call this as overcoming financial obstacles that stand in the way between you and abundance. It would be best to tap into the chatty, talkative energy of the Moon conjunct with Mercy to talk yourself out of any bad situations that may arise. The Moon makes a trine with Jupiter, which amplifies the need cut ties with anything toxic in your life. Last but not least, the Moon makes a trine with Uranus, boosting your intuition. Let it guide you to where you need to go. The numerology of the day is 5, a number foretelling that there are obstacles that may seem insurmountable, but can be overcome. Mantra: Gotta keep keeping on. The activity in the cosmos dies down a little today. The only aspect to discuss is the Moon entering Cancer at 9:56 AM EST. 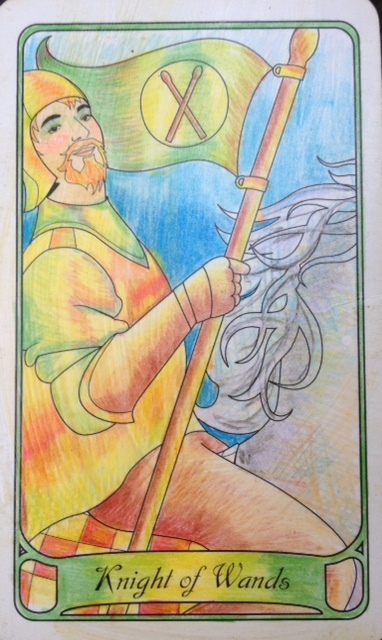 The card for the day is the Knight of Cups, who is also ruled by water, like the sign of Cancer. The Scorpio Knight amplifies the nurturing, loving energy of the Moon in Cancer, making all emotional matters amplified, especially ones regarding love and relationships. Use the positive side of these forces to give and receive as much love as possible for only through love does healing occur. The number of the day is 6, a number of harmony and abundance. The covered woman holding the child on the Six of Swords is moving away and starting her life over again. The child represents new beginnings and fresh starts where the swords represents the troubles that she is taking with her even though she wants to leave them behind. The trip over the clam waters suggests that she is moving toward a better place and will eventually leave the swords she’s not ready to discard yet behind. The Sun enters Gemini, the realm of spontaneity, playfulness, communication and writing. Usually, this would be a powerful time but Mercury in retrograde makes things a little wonky so allow the benefits of Gemini come to you passively, especially with the Moon making a trine to Neptune. The Moon will make an opposite with Pluto which may leave you feeling nervous and confused about the changes this Mercury Retrograde is bringing, but the Moon’s conjunction with Venus will help you create stability by focusing on the beauty around you. The number of the day is 7, the number of reassessing and re-evaluating what we need and what we should let go of. Mantra: You can’t take it with you. 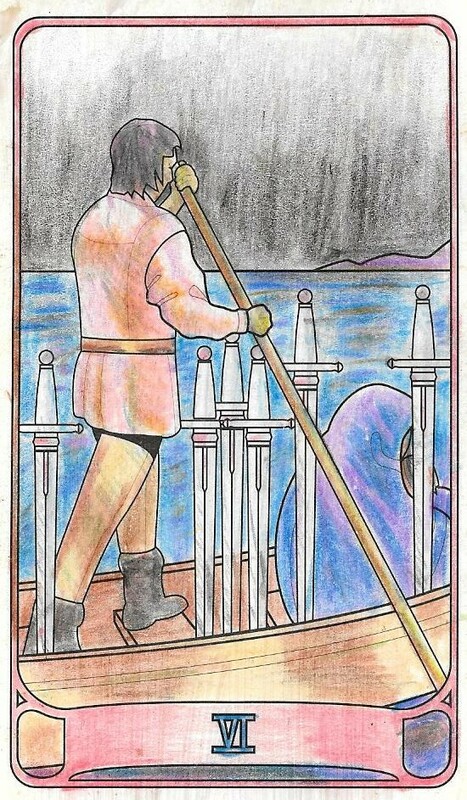 The 6 of Wands shows a victorious homecoming. It’s going to be a sunny day as the Moon moves into the Sun governed Leo. This will give you an extra push as the fire energy of Leo and the Wands team up to help you successfully obtain what you’ve been working towards. The Moon will also make a sextile with the Sun, clearing obstacles and bringing the harmony and balance evoked by the number 6 along with it. Part of being victorious is accepting outcomes, so as the Moon makes a trine with Saturn, we’re reminded to accept the victory without desiring a perfect outcome. This is the third day that a 6 has appeared in the forecast, which means it’s a good time to bring up the meaning of repeating 6s; and it has nothing to do with Satan. Repeating 6s call for balance in order to success. The number of the day is 8, which reminds us that everything we do has a positive and negative reaction and that everything is really just a part of the infinite cycle of being. 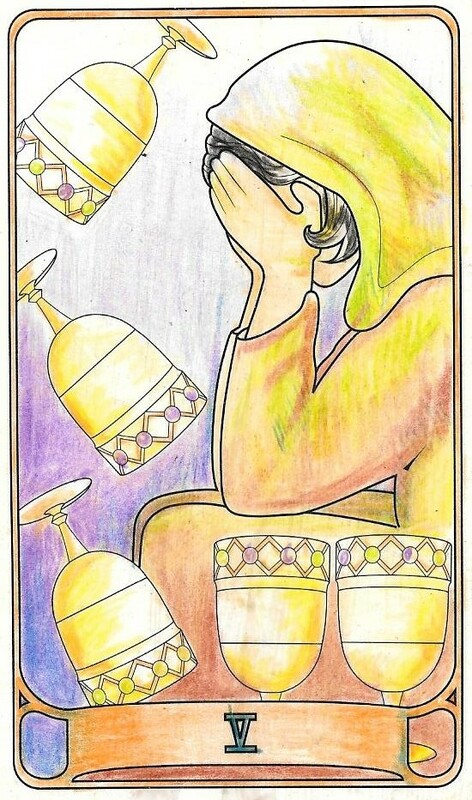 The 5 of Cups reminds us that we shouldn’t cry over spilled milk. When the Moon is in Leo, people may act out when they want to be comforted or need affection to help ease their pain. A lot has happened and a lot more will happen so don’t be afraid to ask for help when you need it. And if someone around you needs help, offer it. The Moon makes a sextile with Mars, calling us to be thankful for our bodies and our health. The Moon also makes a sextile with Mercury, making it a good time for writing. Perhaps writing down what you want to get rid of and then ripping it up may help you release some of the hurt that you’re holding on to. The number of the day is 9, signaling that it’s time to leave all the weeks’ events behind, recognize you did your best, accept your successes and failures and move forward. Mantra: It could be worse. This entry was posted in Astrology, mysticism, numerology, Qabalah, self help, spirituality, Tarot and tagged astrology, divination, motivational, numerology, occult, self empowerment, self help, tarot. Bookmark the permalink.